First step was to spend some additional time sanding the hull. In order for the finished boat to look good, I had to smooth out every divot, clean up the edges, etc. Yet more sanding – and after every pass, it seemed like I found new stuff that had to be handled. Finally, I had to declare things “good enough”. 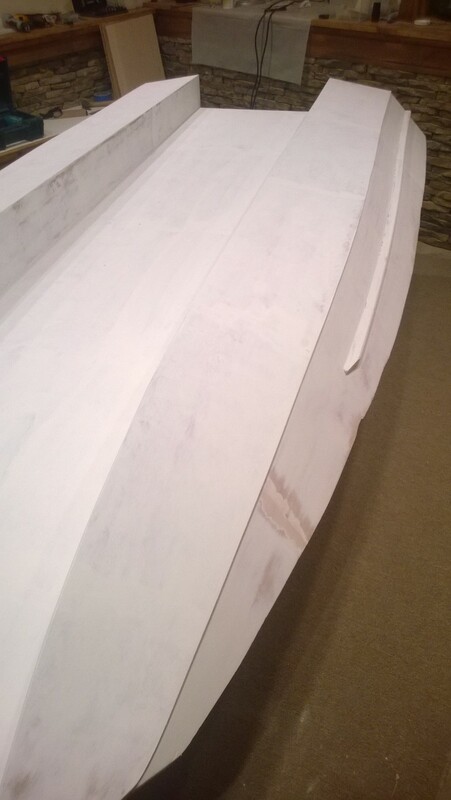 After sanding, I sealed the hull with a clear sealer. 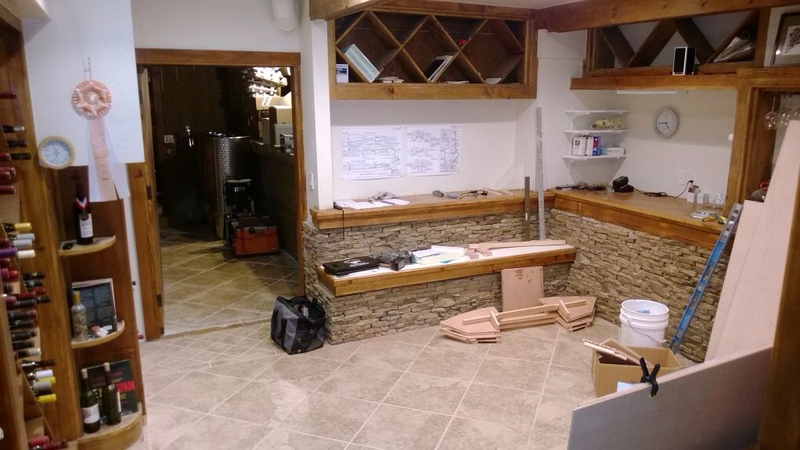 The point of the sealer is to protect the wood from the water. Since I won’t be leaving the boar in the water for more than a few hours at a time, it may not have been necessary. But, I figured what-the-heck, might as well do it right. After sealing, it was time for another pass with the sander. The sealer leaves a rough texture when it dries, so I had to smooth that out. Once the hull was smooth, it was time to prime. The job of the primer is to smooth out imperfections (of which there are many!) and help the paint to stick. It is nasty stuff. Thick and sticky and toxic-smelling. I put on one coat and let it dry, then it was time to sand again. After sanding, I did a second touch-up coat of primer, and put the stuff away, hopefully for a while. After priming, it was finally time to paint. But before that, it was time to address the paint odor issue. Painting in the basement was smelling up the whole house. And, I was worrying about the toll that all these fumes were taking on my limited stocks of brain cells. So, I bought a cheap canopy and the best respirator I could find, and moved the whole kit outside. The paint went on smooth and looked awesome when it dried. I went with white for the hull, with dark blue trim. Managed to get two coats of both colors on while fighting the heat wave. Early morning breeze and late morning heat (not supposed to paint when it is hotter than ninety degrees) left me a slim window. The boat looks great from a distance – just needs a little touch-up. I’m not going to let anyone within five feet of her, though… that is where you can start to tell just how much of an amateur I am! But I am happy with things so far. Usually when boatbuilding, the “flip” is a big deal. With most boats, it is difficult, takes lots of people, and is followed with celebratory drinking afterword. In my case, though, it just takes two of us to pick her up and turn her over – about like moving a couch. So I skipped the party, flipped the boat, put a coat of sealer on the inside of the hull, moved her back inside, and started plotting my next steps. 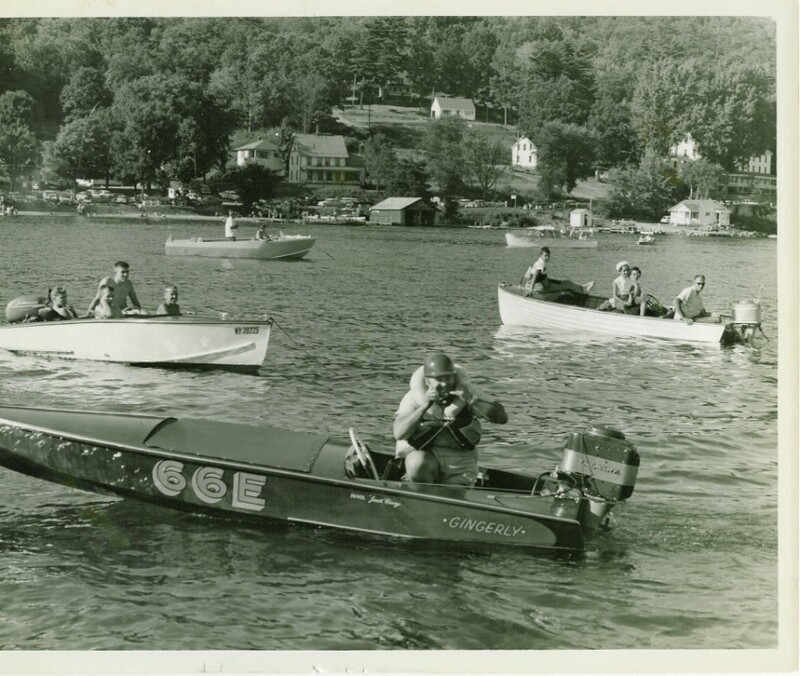 This entry was posted in Boats on June 15, 2014 by John Beekley. 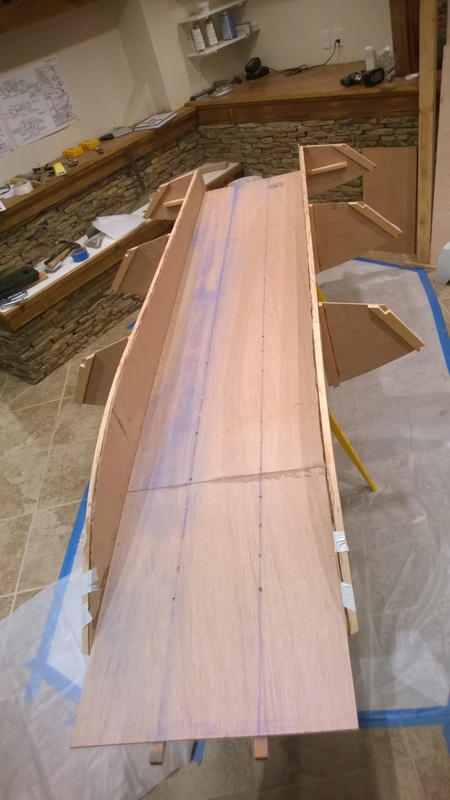 In my last post I was excited to report that the side panels were installed, and now I am equally thrilled to report that the tunnel floors are now in place as well, meaning that the hull is essentially assembled. This means that if I turned her over and put her in the water, she would float. I could even get in and paddle around! But, it’s not time for that yet. Installation was complicated by the fact that there is really no way to clamp them into place. This meant pre-drilling all the screw holes, applying epoxy, holding the panel in place on the frame, and screwing it into place. I was determined not to have a colossal, glue-y mess… and I was successful in this regard. Once the tunnel floors were installed, there was just one more simple installation step, and that was mounting the splash rails. It wasn’t as easy as it looked, but I got it done in good order. 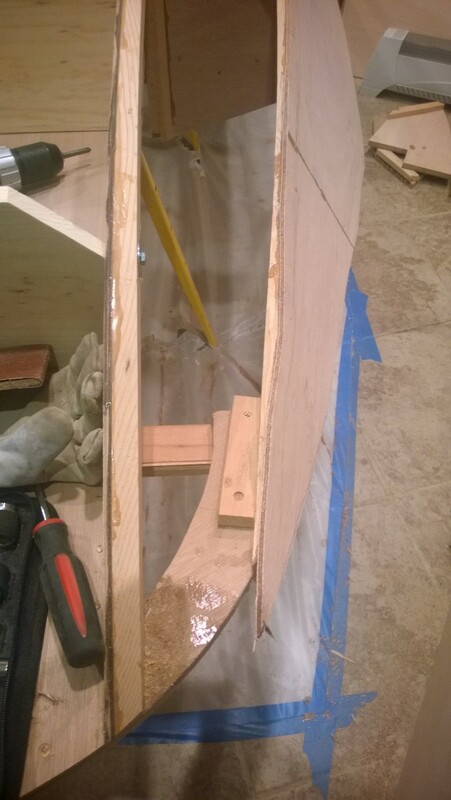 So, once the splash rails were on, I had a completely assembled hull… complete with rough spots, minor overhangs and gaps, and hundreds of countersunk screws and nails. Hardly something ready to finish. 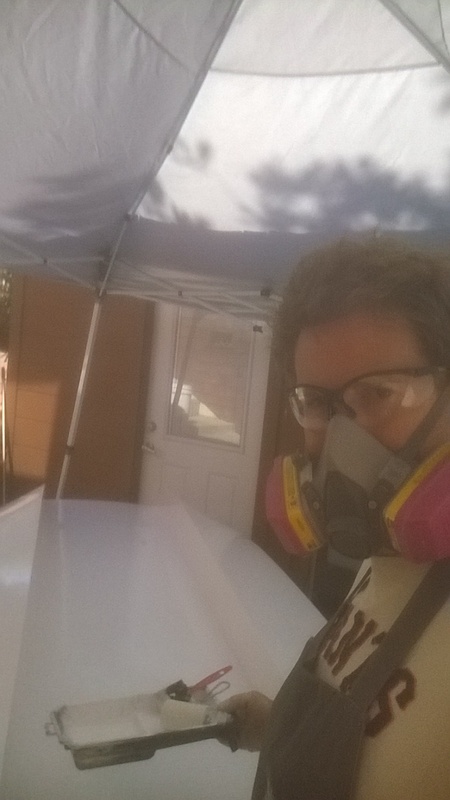 So, I went out and bought some fairing compound, a bunch of sandpaper, and a random orbital sander, and got to work. Thanks to my inexperience, this turned out to be a lot of work indeed! Much, much hand-sanding, filling and refilling, more sanding, etc. A couple weekend’s worth, in fact. It will go much faster when I do the topsides, I promise you that! Now, while it is not perfect, it is good enough, and/or as good as it is going to get! This means that it is time to seal, prime, and paint the bottom, prior to flipping her over and working on the top side. I am going to get started this weekend, and I can hardly wait! 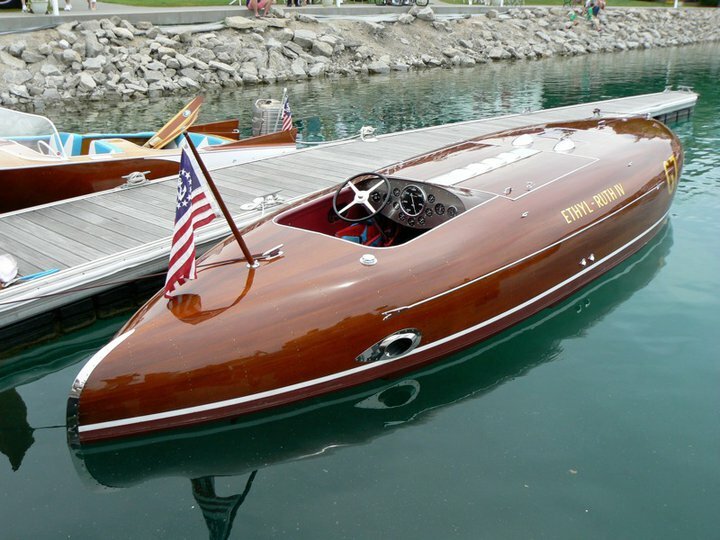 This entry was posted in Boats on May 28, 2014 by John Beekley. At the time of the last update, the frame was completely assembled. 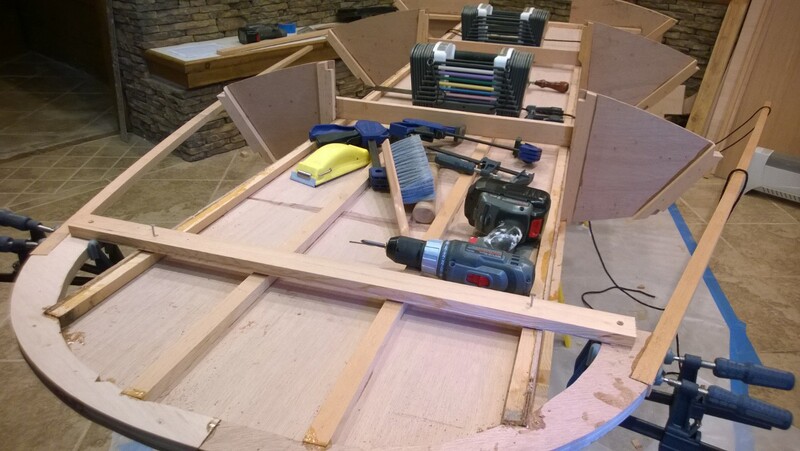 The next step after that is to start installing the plywood panels that make up the hull of the boat. But, first, there is some fairing to be done. What, you may ask, is “fairing”? 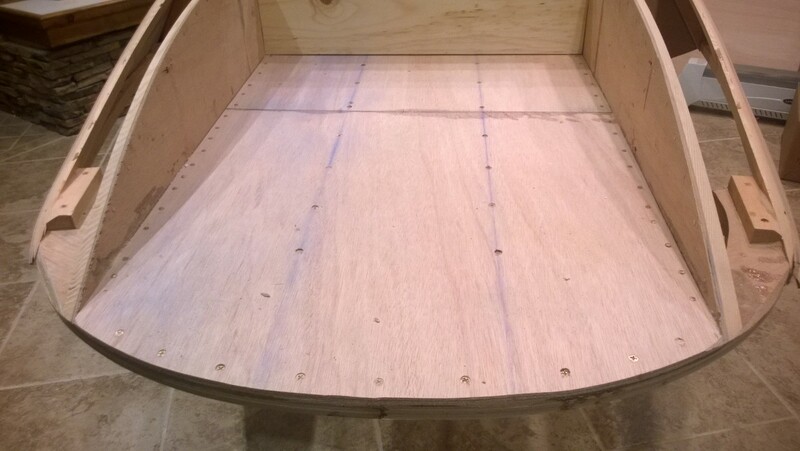 The answer is, fairing is the process of planing, sanding, bending, etc., that makes the frame properly shaped such that the plywood panels fit snugly and securely. 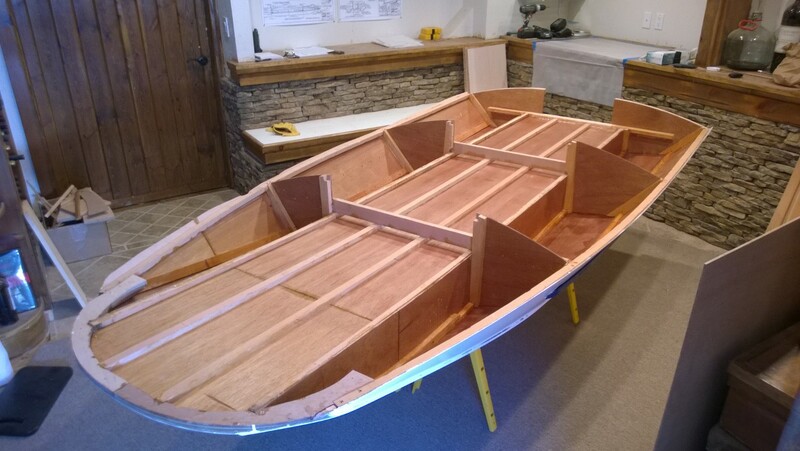 The pictures below show an “unfaired” section of the boat, along with a similar section where fairing is complete. To do this with an degree of efficiency, I needed some tools that I did not have – one of which I bought, and one of which I made. The tool I purchased is a power planer, which makes quick work of removing wood. It generates prodigious amounts of wood shavings, but conveniently hooks up to a shop-vac for easy collection of said shavings. The other tool I needed was a strip sander; that is, a sanding block that is 18 inches long and three inches wide. This tool allows me to sand two frame members at the same time, so that the faces I am sanding are pretty much co-planar. The tool is simply a strip of plywood with handles on one side and sandpaper (actually, a sanding belt that I cut) stapled on. Works like a champ! When I got ready to dig into this task, I noticed something distressing: part of the tunnel frame had warped. The picture to the left shows how bad the warping is – the tunnel side should be exactly square, and is clearly far from it! Not sure why that happened, but I was pretty sure I had to fix it – I had visions of my slightly asymmetric little boat running around in tight circles as her crooked tunnels would not allow her to go straight! It was easily fixed by installing a couple braces in the tunnel itself; these will be a little tricky to remove once the bottom is installed, but we will cross that bridge when we come to it! Once the tunnel was straightened, it was time to start fairing in earnest. All frames had to be beveled so that they were roughly co-planar, then they had to sanded with my long samding block so that they were perfectly flat with each other – or at least as close as I could get them. It got particularly tricky up at the bow, where the boat is curved, and everything somehow converges together. I have a feeling that at some point it is going to take a lot of epoxy and filler to make everything clean and watertight. Once fairing was complete, it was time to glue the panels to the frame. With a bit of trepidation (and lots of epoxy everywhere!) 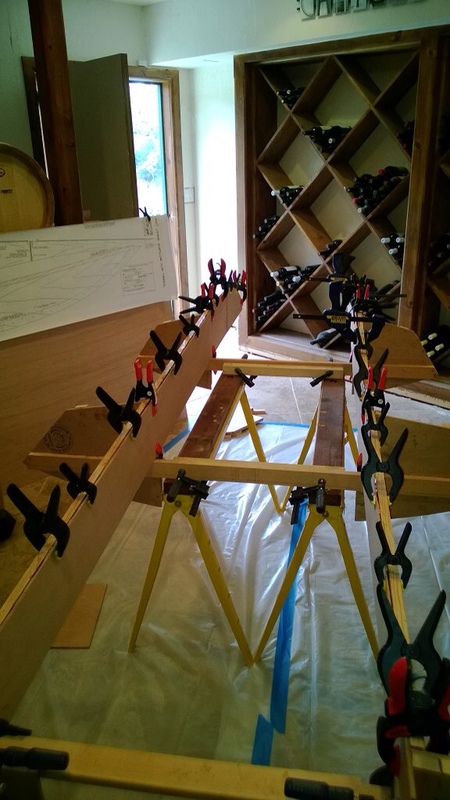 I clamped on the panel on the port side. It took every clamp I owned to hold the thing in place, so I had to wait a few days to put on the starboard side. As you can see from the pictures, initially the fit of the panels is pretty rough. Once the side panels were installed, another big fairing task was required to get ready to install the tunnel floors. 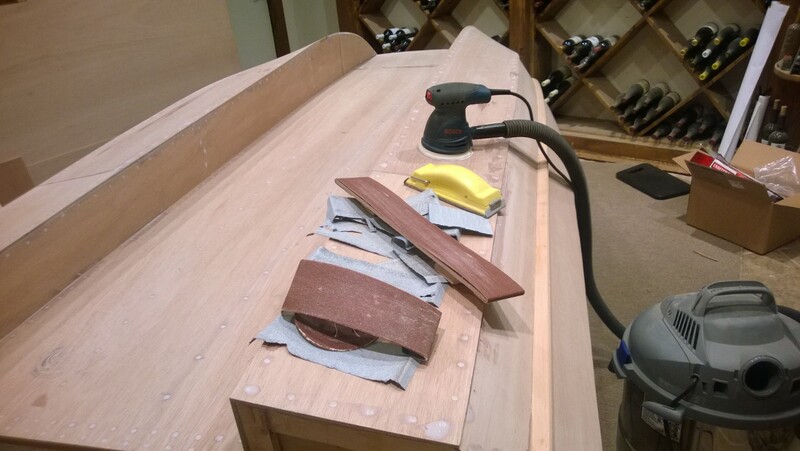 Both the chine logs and the tunnel runners needed to be extensively beveled and sanded so the tunnel floor panel will fit snugly. I am very interested to see how it all comes together at the bow. Hopefully I will find out this weekend! 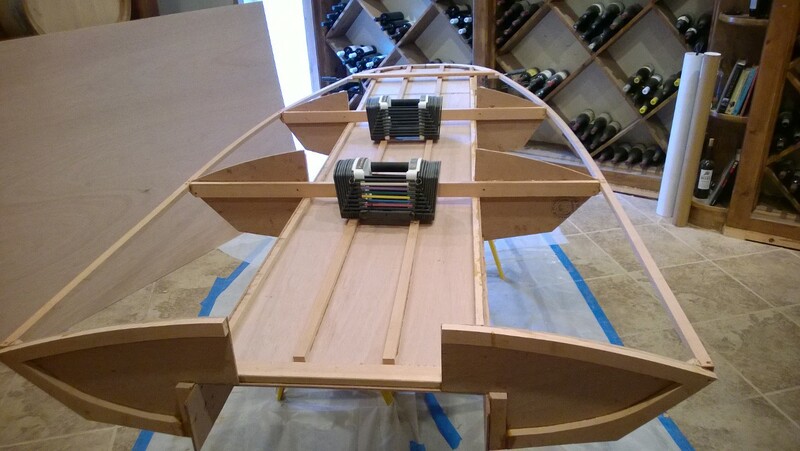 Here are some photos of the faired hull, ready to start working on tunnel floor fit and assembly. I cleaned things up a bit for the occasion. Enjoy! This entry was posted in Boats on April 15, 2014 by John Beekley. 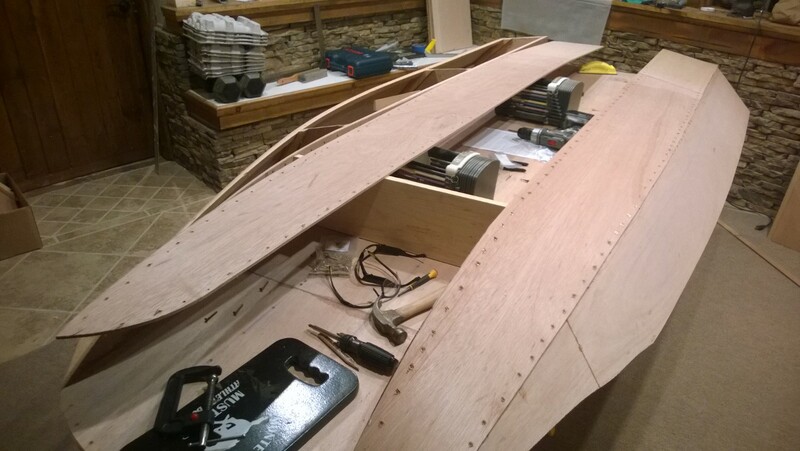 It has been awhile since I published an update on how the boat is coming. It does not mean that I haven’t been working on it, because I have! But I certainly have been going slower than I would like. Since I am no real hurry, though, I am not complaining. At the end of my last update, I was getting ready to install the floor of the boat, known as the “tunnel floor”. 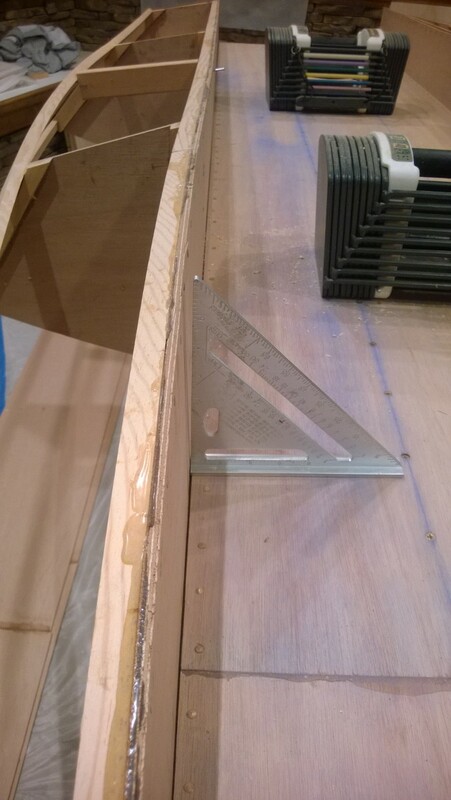 Before adding the floor, I had to mount battens along the frame to support the plywood floor, which is only a quarter inch thick. Then the floor was ready to be mounted, using epoxy and screws. The lines on the tunnel floor are chalk lines which show the locations of the battens underneath the plywood. After the tunnel floor was installed, it was time to turn the boat over and do some work on the front of the boat, or “bow”. 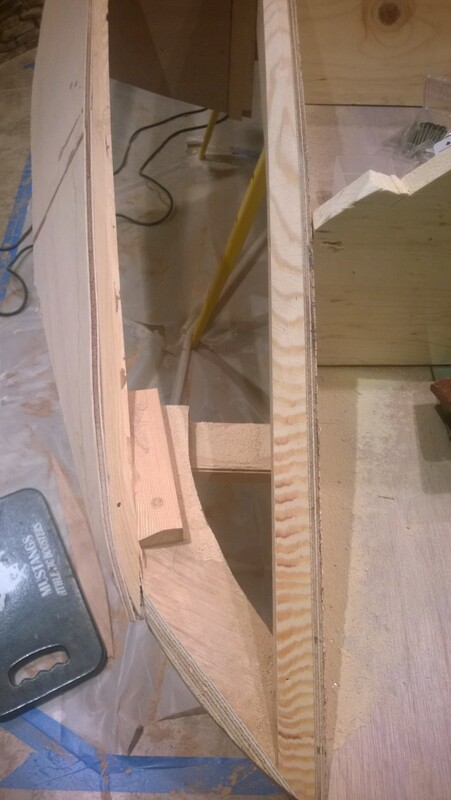 The bow piece is where all the framing elements come together, so I installed that to the floor and battens using healthy amounts of epoxy and screws. The picture below shows the bow of the boat, with the bow piece being the curved member towards the bottom of the picture. 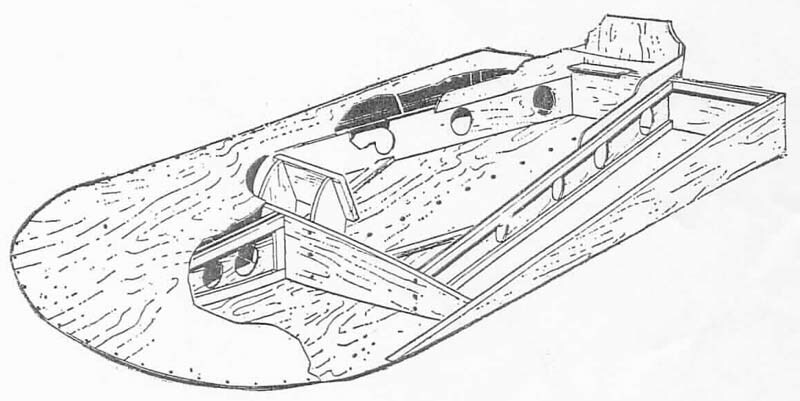 The long strips of wood that are held to the bow piece with clamps in the picture above are called the “sheer clamp”. These framing members basically define the border between the deck of the boat and the sides of the boat. As the sheer clamp has to be bent into shape, it was a little tricky to install. 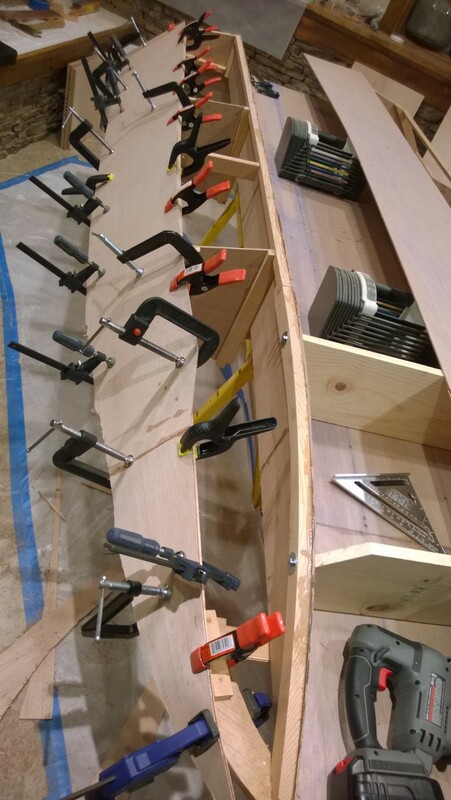 Since the boat is very flexible at this stage, it is easy for the tension of the bent wood to deform the hull. So, I tried very hard to keep everything symmetrical, and in balance. 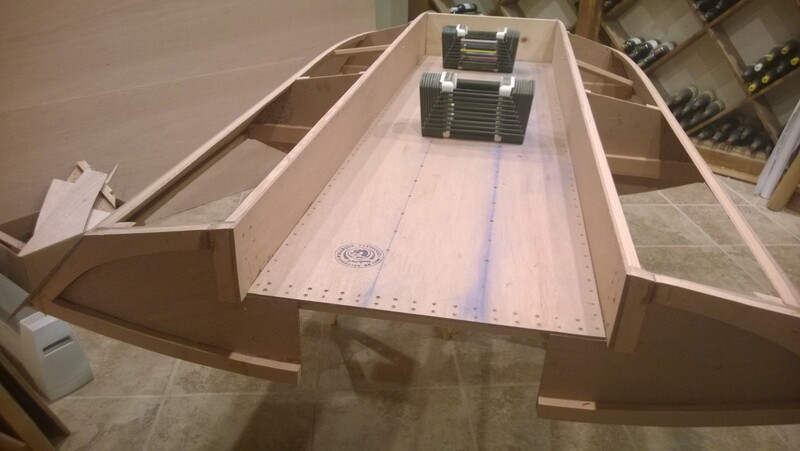 The picture below shows the boat right-side up, with the sheer clamps installed. In case you are wondering, those are tow 50-pound dumbells on the top of the boat, I use these to keep the hull firmly on the sawhorses. 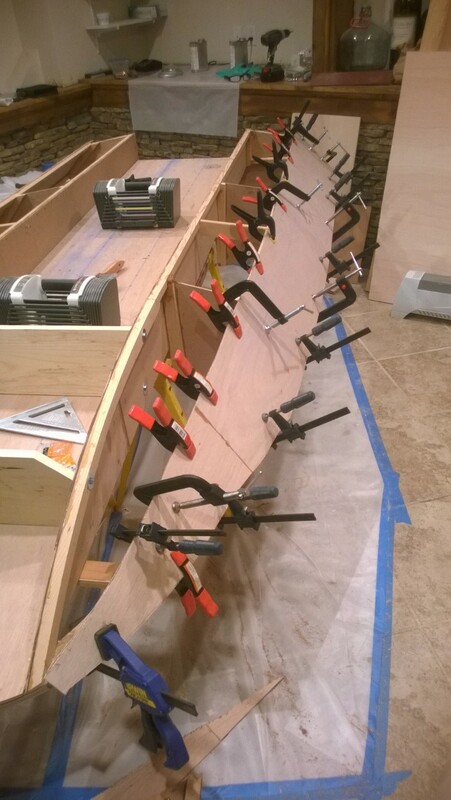 Now that the shear clamps are installed, it is time to turn the hull back over, and install the chine logs. The chine log is the framing member that sets the boundary between the side of the boat and the bottom. If you think these names are confusing, you are not alone. I spend lots of time scratching my head over this, and doublechecking to make sure I am working on the right thing! The chine logs are another frame member made with bent wood, that need to be installed very carefully so as not to deform the hull. It also turned out to be quite tricky to make all these pieces come together properly at the bow of the boat. I *think* I got everything right, and am hoping I don’t get surprised later! Once again, liberal amounts of epoxy seem to help. The pictures below shows where things are now; click on any of them for a closer view. 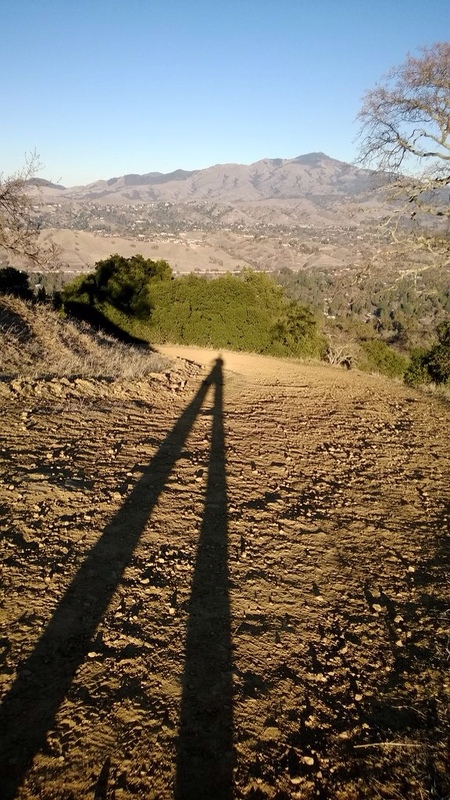 If you use a little imagination, you can almost tell that it might end up as a boat! The next step is what is known as “fairing”. 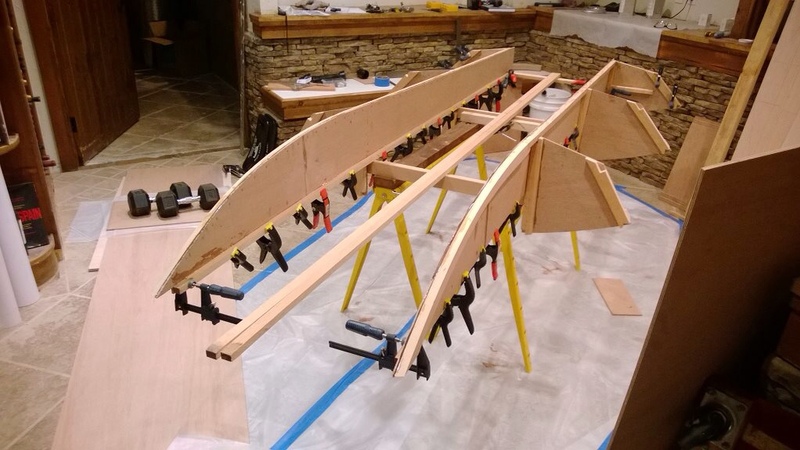 Basically, fairing is the process by which all edges are smoothed, bevels created, and curves adjusted such that the planking matches perfectly with the frame. As I am very challenged as far as detail work is concerned, this might be interesting! 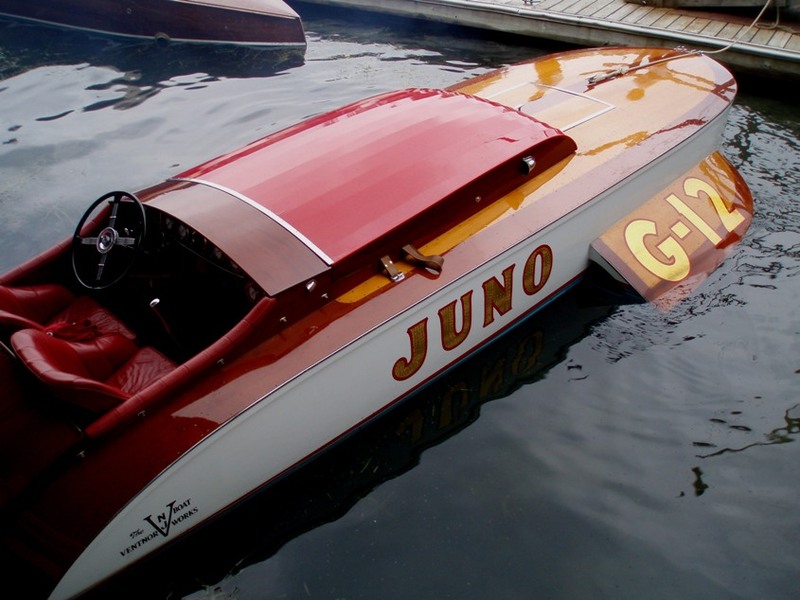 This entry was posted in Boats on March 20, 2014 by John Beekley.